E! News's tweet - "Squad. #GRAMMYs #BTS "
BTS is looking so charming and handsome. Walking like models. 또 한 번 우주가 돕는 구도. 중심잡힌 준이, 바로 곁에 구오즈, 맏내-막내, 솝으로 든든하게 버티는 이 그룹. 소년단의 단단함이 한 눈에 보인다. #TearItUpBTS those are my boyss!! 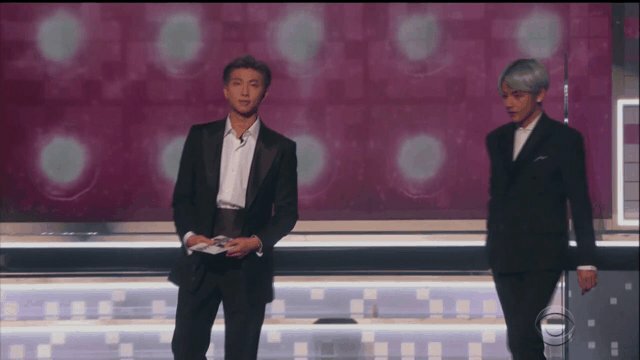 Namjoon esta como, lo logramos. Some people may excuse the Grammy's but the magnitude of this experience is still quite monumental like what the fuuuuuuuck.